Cash flow finance is a term that can encompass all the invoice finance products and also some business loans. Even an overdraft might fall under that category. Pretty much any finance that is for working capital purposes i.e. not to buy an asset, could be included under this banner. I thought I would check how easy it is for a company to find cash flow finance quotes when they search the Internet. This is the typical type of customer that we might help with an independent search of the invoice finance market. So this search could be made by the owner of a new startup business that has decided they need some funding to improve the flow of money through their company. Perhaps they have some unpaid invoices tying up their working capital, so invoice finance would be a good fit, and perhaps they have suppliers to pay. They may not be clear what types of funding are available, so they use a generic search term. I had a look at how easily, and quickly, they can find their way to service like our that can provide the quotes they need. You may recall that I looked previously at how difficult it is for startups to find business finance via a web search. This article addresses a different type of search. The top result is an advert from one of the independent invoice finance companies, so a good start. Google adverts work by advertisers bidding to get their ads to the top of the list for various search terms. Of course this only means that you see the ad from the party that is bidding the most, and their position in the search results does not assure you of their standing. Although organic search results (positioning according to Google's ranking of your website according to various factors such as incoming links from other websites) are not any assurance of standing either. A better strategy is to find a party you can trust, and ask them to recommend providers. This is the gap that we, and our peers, try to fulfil with our brokerage services. Anyway, returning to the top search result (the paid inclusion ad from an independent provider) the text of the ad included the following: "Fixed rates 7% - Same decision and funds in 24 hours. Profitably business, minimum £50K turnover, minimum 3 years trading". Putting aside the word "day" being missing from "same day decision", the qualification criteria do not appear to include new startup businesses, who often are those most in need of cash flow finance. So this offering appears to only available to more established companies, the fixed rate part also suggests it might be some form of loan being offered, although I know this company also offers invoice financing. The top organic search result was from one of the banks. Their page was headed Cashflow Finance and it took me through to a landing page that offered their invoice finance services. Again you would think this was a relevant result, however their site requires forecast sales of £500K per annum, "reasonable profitability" and a "range of debtors", which will exclude new start companies. It also says at the foot of the page that their products are available to clients of the bank - again not much help if you don't bank with them, and don't want to move your banking. On the right hand side at the top of the page is another organic result, this time from Investopedia (a site to help you understand complex financial terms), which provides more of a definition of what cash flow finance is, rather than access to providers. However, the explanation below says ". . . talking about loans against expected cash flow" - this may be true but is not really in terms and SME is likely to use. So again not much help in my customer's search for a provider. What does cash flow mean in finance? What does it mean when a business has cash flow? None of these questions are what our example customer is looking for. So to the next organic result, that is from an Australian company, offering cash flow funding to Australian companies only. It is likely that our search term is common amongst Australian companies, and hence they are showing up in our seach results since Google recently changed how they decide on the results to present to people that make searches - you no longer just get just UK results if you search via Google.co.uk. The next organic result is the definition from Investopedia again - still of no help in the customer's search. The next result (the 5th - depending upon how you count them) is from a firm of invoice finance brokers, who are owned by Insolvency Practitioners (IPs). Their website says that their service is "impartial", so this could suit the customer. This impartiality may not be the case for all firms owned by IPs. There have been some concerns that some IP owned finance brokers may be urged to introduce new customers to providers that pass reciprocal work to the insolvency arm of the group, this does not of course apply to all such cases. The next result (6th) is from the ACCA, an accountancy body and their landing page is a good article that explains invoice finance. However it doesn't give any obvious route to connect with providers, and the button at the top headed "Apply Now" takes you to a page about applying to join ACCA, rather than applying for cash flow finance. The 7th result is from a company offering funding against credit card takings, not all companies trade this way and the site requires 4 months trading with £2.5K card takings as a minimum each month. Once again, not suitable for our example customer. The 8th and 9th results are both from the same independent funder that had paid for the Google click advert at the top. Then the 10th and 11th results were form two other niche invoice finance companies. The first is an invoice finance company with a £150K minimum turnover requirement and the last of the organic results is another small independent that specialise in difficult deals, and they will accept startups. The final entry on the page is another paid inclusion advert, this time a broker whose company was incorporated just under a year ago, but they sound as if they might be able to help our example customer. The saga above demonstrates the difficulties of finding cash flow funders that offer invoice finance services to new startups. It is hit and miss if you just randomly pick results from a Google search, you could get a bank who only deal with their own larger customers, a niche independent provider, a tied broker or an independent broker. You may not see a perfectly suitable provider's result as they have put no effort into appearing in the online search results (I know of at least one invoice finance company that have almost no interest in web search positioning) and it takes either money, and or effort, to rise up in the rankings. 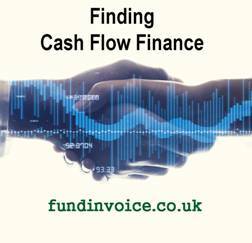 FundInvoice offer an independent quote search and advice service for invoice finance, and other forms of business funding. We have undertaken a lot of research to compare prices and service levels from providers, please call Sean on 03330 113622 if you need help finding cash flow finance.